Official artwork of Dr. Wright from SimCity. Dr. Wright (ドクターライト, Doctor Wright) is a character that appeared in the SNES version of SimCity. In Super Smash Bros., he is seen as a normal trophy in Super Smash Bros. Melee as well as an Assist Trophy in Super Smash Bros. Brawl, Super Smash Bros. 4, and Super Smash Bros. Ultimate. Dr. Wright as the adviser in SimCity (SNES). 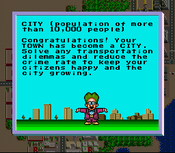 Dr. Wright made his first appearance in the SNES (and cancelled NES) version of SimCity. In SimCity, he acts as an adviser for the player, giving players tips on how to manage the city. Named after series creator Will Wright, he possesses tall green hair and eyebrows with a black toothbrush mustache. He wears spectacles and a brown suit with a purple bow tie, and holds a white baton. Dr. Wright helped the player by giving the player hints and suggestions on how to get the city prosperous, while preventing its destruction from various disasters, natural and otherwise - including a Godzilla-like attack from none other than Bowser. He reappeared in this role in the Japan-only SimCity 64, which was developed by HAL Laboratory. As a character appearing in games of a primarily PC-based series not owned by Nintendo - although the character himself is owned by Nintendo - Dr. Wright is relatively obscure. He is rarely referenced outside of Smash, although he is the basis for the characters Mr. Write and Dr. Left from the The Legend of Zelda games. Dr. Wright appears as a trophy. The assistant to the mayor of SimCity, Dr. Wright was actually named after the creator of the game. As a player, you'd have to use your wisdom and experience to give timely advice to the mayor; if you did a good job, the city prospered. Dr. Wright is one of the leaders in the all-time, bizarre Nintendo-game-hairstyle contest. Dr. Wright causing buildings to appear in Brawl. Dr. Wright uses his baton to erect three skyscrapers beside him, hurling players into the air. There is a one in ten chance that he will instead create super scrapers, covering a larger area and dealing more damage. Dr. Wright's trophy in Brawl. A hardworking assistant to the city mayor. He has distinctive hair and spectacles and a dapper moustache. Dr. Wright has a comprehensive knowledge of city government and is happy to give you tips to keep your city running smoothly. In the game, he tracks your city's status and gives you gifts. There was a character reminiscent of him in The Legend of Zelda: Link's Awakening. Dr. Wright as he appears in Super Smash Bros. for Wii U.
Dr. Wright returns as an Assist Trophy with the same function as in Brawl. This hardworking assistant is the most trustworthy partner a mayor could ask for. If trouble strikes your city, he'll be right there to offer advice. In Smash Bros., he'll attack by constructing a building in the middle of the battlefield. It's tough to aim but can launch your foes. As the mayor's hardworking assistant, Dr. Wright will sometimes bring ideas to the table when it comes to the delicate art of city-building. Other times, he'll bring gifts! His gift to you in this game is an attack that makes a new building shoot up in the blink of a eye. Use it to become the architect of your enemy's destruction! Dr. Wright as an Assist Trophy Super Smash Bros. Ultimate. Dr. Wright appears once again as an Assist Trophy, and his behaviour is unchanged from the previous two games. The only noticeable change from the previous games is that his entrance animation is slightly different. He can be defeated if he takes enough damage, though doing so can be quite difficult due to how short he remains onscreen. Official artwork of Dr. Wright for Brawl. Dr. Wright as an Assist Trophy in Super Smash Bros. for Wii U. Official render of Dr. Wright in Super Smash Bros Ultimate. Interestingly, Dr. Wright is one of only three Assist Trophies in Brawl whose actual trophy is posed differently from his artwork on the Smash Bros. DOJO!!. Lyn and Mr. Resetti are the others. 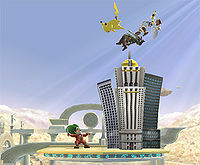 If Dr. Wright is facing away from the stage into empty space, then he will sprout the building on the platform under him. If there are no platforms under the platform he is standing on, he will sprout the building where he is standing. Dr. Wright is the only character in the Super Smash Bros. series created and owned by Nintendo to hail from a third-party universe, as SimCity was originally created by Maxis and is owned by Electronic Arts. Dr. Wright is voiced by Nate Bihldorff, a Senior localization manager for Nintendo of America and voice actor of Shy Guy in the Mario games. While Dr. Wright is owned wholly by Nintendo, his series is not, rather being owned fully by Electronic Arts. This puts him in a strange place as he's a first-party character from a third-party franchise, likely factoring into his obscurity. This page was last edited on April 1, 2019, at 17:03.